Dusty Crophopper has flown into our Yumbox for a lunchbox surprise visit. I'm loving how cute but yet so simple this lunch is. 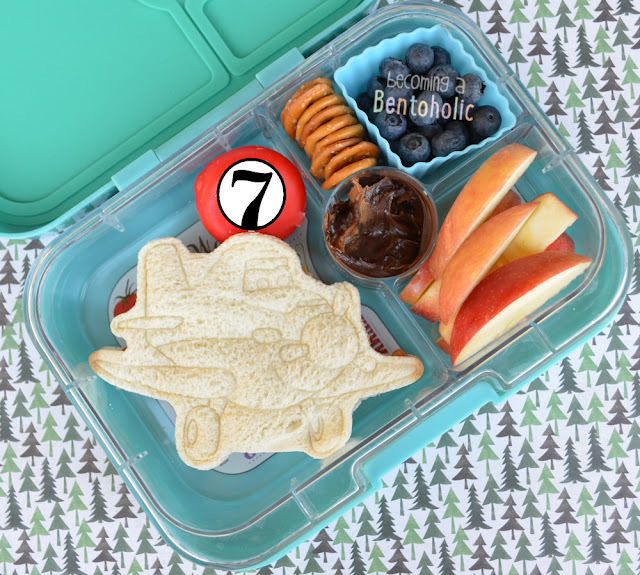 In this bento: Ham & cheese Dusty Crophopper sandwich, Babybel cheese decorated with Dusty's #7 (the number was printed, cut out, and taped on), pretzels, blueberries, apple slices, and Trader Joe's cookie butter cocoa swirl for dipping. The Dusty cutter came with issue 44 of Disney Cakes & Sweets - Yes, I have a subscription!